Previously, I wrote about the Ukhupacha (the Lower World) and the Kaypacha (the Middle World) in conjunction with teaching the corresponding weekends of the Pachakuti Mesa Apprenticeship Series. I recently co-taught the third weekend of the Apprenticeship series with my wife, Autumn. After delving into the other two worlds, we finally explore the Hanaqpacha. Call it Heaven. Fólkvangr. Vaikuntha.Tir Na Nog. Elysium. The Upper World is a concept found in most every major spiritual faith on the planet. It is most often attributed to a place where souls reside in the afterlife as a reward for a virtuous life. Other cultures view it as realm of ascended enlightenment (i.e., Nirvana) rather than a location. In indigenous Peruvian cosmology, and particularly in the Pachakuti Mesa Tradition, the Hanaqpacha is a dimension of consciousness represented by transpersonal experience. This realm is often referred to in celestial terms, where angels and ascended masters reside to guide us on our earthly walk. I often refer to it as a beacon, shining its light as an inspiration to guide us home. Yet, despite these positive associations, I have always been afraid of it. When I was 9 years old, I recall a day when on the way to school, my mother and I listened to a man on the radio who had decided that very day would be the last day on Earth. The skies would open. God would judge us. All life would end. The sinners would go to Hell and all others live in Heaven forever. I remember spending the rest of the day in a panic. What would happen to my friends, my family? Would we be separated? Who would go where? Even if I was one of the lucky few to get to Heaven – as if it was some sort of lottery – would my loved ones be there with me or would I have to spend an eternity without them? It seemed so cruel. As the hours in the day ticked down to the exact time of the prediction on the radio, I cried and prayed with hands folded, urging God to keep our family together, my body trembling in terror. Soon I began to realize that I didn’t even want to meet this God, it was too scary a notion for a boy’s young mind to handle. What if I said the wrong thing? Would I be banished to an eternity of torture? Unfortunately, this has been a stigma I, and many of us, have had to live with our entire lives. But cross-cultural shamanism teaches us that the Hanaqpacha is not a separate realm to cast judgment upon us lowly ants below. In the Pachakuti Mesa Tradition, the layout of the mesa altar itself emulates a cosmology that shows us the network in which the Hanaqpacha is merely one aspect of many here to support our growth as souls in the universe. As discussed in my previous installment, Embracing Relationship: Thoughts on the Middle World, I noted how the Kaypacha realm can be represented horizontally on the mesa as a conjunction of the West (Mamakilla) and the East (Inti Tayta) communing together to form the expression of our souls (K’yuchi) in this Middle World (the Kaypacha) in which we live. Very easily then, the South could demonstrate the nuances of the Lower World (the Ukhupacha), and then the North as the Upper World (the Hanaqpacha). In the PMT we typically stand at the South of the mesa, looking North. It is the direction we are constantly striving toward. This the realm of Creator, our origin point, our Source. It is a recognition that we all come from God and shall eventually return to God. The animal totems residing in the North of the Pachakuti Mesa are the condor and eagle. These winged ones are known for their massive wing span and ability to soar on high winds. From high in the sky, in Wiracocha’s realm, they look down on the Earth below where everything seems so small, where no borders exist, where all of Pachamama seems like one living organism. We humans included. All is equal in the eyes of the Hanaqpacha. There is no judgment. There is no reason to be afraid of one’s intrinsic Divinity. According to the Big Bang theory, all matter in the universe came from one singular cosmic egg which contained all things. If that cosmic egg is indeed the Source, the great mystery which we most commonly refer to as God, then the expansion of that egg and the resulting explosion is an incredible model of the creation of the entire cosmos. We are a result of that Big Bang. We are in the wake of the universal wave surging across time and space. Gases formed, stars were created, and planets molded from these nuclear interactions in which we two-leggeds eventually sprouted into being. So, here we are, the result of star dust from the breaking of the cosmic egg. In this sense, we are truly the children of God and there is no differentiation among us. The stars exist inside of us, inside of everything around us, if we just look closely enough. This is the essence of communing with the Hanaqpacha: for every rock or feather or being you encounter, you are encountering God made manifest into physical form. So, to relieve oneself of the fear of judgment is to relieve oneself of the fear of your own Divinity. We all truly are the embodiment of namaste, which is the Hindi expression of recognizing the Divine each other. In the Pachakuti Mesa Tradition, we use the Quechua term Noqa Kani, which means “I Am,” to emulate the universal principle of spiritual transcendence, to recognize our Divine heritage. To recite “I Am” is to understand oneself as soul, as aspect of Godhood expressing itself in sacred relationship. In the Judaic tradition, when Moses ascended the mountain to encounter God in the form of a burning bush, that expression of God identified itself merely as “I am that I am.” It is an understanding of who we are as humans, representatives of the Divine Soul seeking to harmonize with itself. The entire layout of the mesa teaches us this: with Wiracocha before us in the North, Pachamama supporting us from the South, and the polarities of Mamakilla and Inti Tayta in the West and East. Daniel Moler is a writer, artist, educator, philosopher, esotericist, and all-round student of life. Daniel has published fiction and nonfiction works around the world in magazines, journals, gaming modules, online, and the author of Machine Elves 101 and Red Mass, as well as a contributor to Ross Heaven’s book Cactus of Mystery. 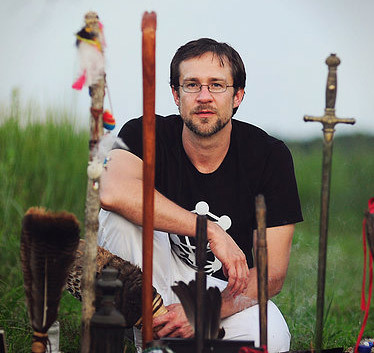 Among being trained in a variety of alternative spiritual arts, including the Holy Qabalah, Daniel is a sanctioned teacher of the Pachakuti Mesa Tradition, a form of Peruvian shamanism brought to the U.S. by respected curandero don Oscar Miro-Quesada.